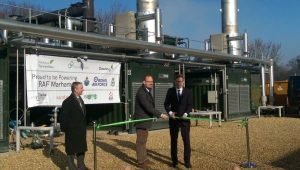 Biogas power will generate Green Electricity for a Norfolk Military Base it has been announced. The UK Anaerobic Digestion Plant will the a first to be used in this way. It will see almost all of the bases electricity requirement supplied from a new on-farm green renewable energy resource now operating. 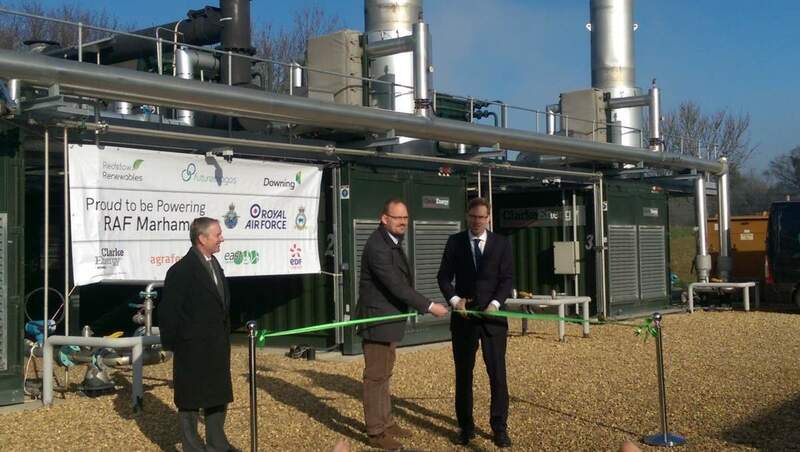 Defence Minister Tobias Ellwood MP at the opening of the Future Biogas AD Plant which will supply the Marham RAF Base. Future Biogas’s Redstow Renewables AD plant, which converts locally harvested crops such as maize, sugar beet, rye, and potatoes into renewable electricity (in the form of biogas) and natural fertilizer, will meet over 95% of the power needs of nearby RAF Marham. The base will be the first in the UK to run almost entirely on green electricity. The AD plant will generate 4.5 megavolt amperes of electricity every day, enough to power 350,000 LED bulbs. The deal will save the Ministry of Defence nearly £300,000 every year and reduce its carbon emissions by 14,000 tonnes of CO2 annually. The waste residue from the AD process will also be dried and used as fertilizer to help grow local crops. “It’s fantastic to see the UK military join the green revolution. If we are to combat the imminent global threat of climate change, everyone, from all walks of life, needs to transition to renewable, sustainable energy as quickly as possible. “This pioneering deal demonstrates the enormous value that AD offers in producing home-grown, renewable energy that is increasing the UK’s energy security and helping to tackle climate change. Future Biogas has announced that an anaerobic digestion plant is to be built and ran by the company to power over 95% of the RAF Marham military base in Norfolk. 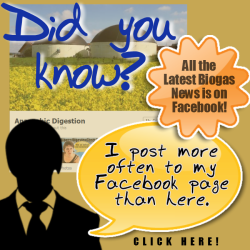 Although it was a “first” for the UK, the US Army has been using biogas for some time. BioConversion Solutions’ (BCS) has an Advanced Fluidized Co-Digestion & Co-Generation (AFC2) anaerobic technology can be used on military bases to provide [what they describe as] the world’s highest conversion rate to biogas for power generation using the base municipal wastewater and food waste as feedstocks. They state that their proven and proprietary AFC2 process greatly improves the security of fuel supplies and energy self-sufficiency for United States and other military agencies. Military installations of the AFC2 process often have the opportunity to share sites and facilities with host communities to defray infrastructure and operating costs as well as to increase the scale of the biomass-to-energy plant. In September 2018, the US Cape Cod Military Base also went renewable (100%) after it was integrated with Otis Microgrid project based on renewable energy. Experts believe that if the US military bases were allowed to develop their full potential to produce green energy, they would be significantly more secure. US armed forces, unlike US administration, has nearly doubles their Renewable Power generation between 2011-2016, as according to them they understand that national security and energy security are entwined. A landmark partnership was celebrated yesterday with a power ‘switch on’ event at Redstow Renewables, in Swaffham. The Minister for Defence People & Veterans Tobias Ellwood MP was the guest of honour. “Britain has a proud history of pioneering ways of promoting and using green energy. The armed forces obviously have an obligation to defend our shores and interests, but we must conduct those responsibilities with a wider interest in the world around us. The UK armed forces own three per cent of UK land, which is a big part of the national real estate. We need to look at how can we create more biogas energy.